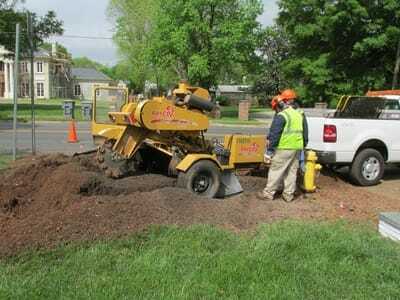 As shown in the change projected as aging trees die off, tree planting is critical to the health and longevity of Charlotte's urban tree canopy. However, tree planting over the next several decades should be methodically planned with a specific purpose in mind. One of the best ways to do this is to define and adopt an official planting strategy to be included in the urban forest management plan. Equitable Distribution. With this goal, priority of planting is given to areas determined to be the most in need based on the goal of an even distribution of benefits trees provide to all residents. 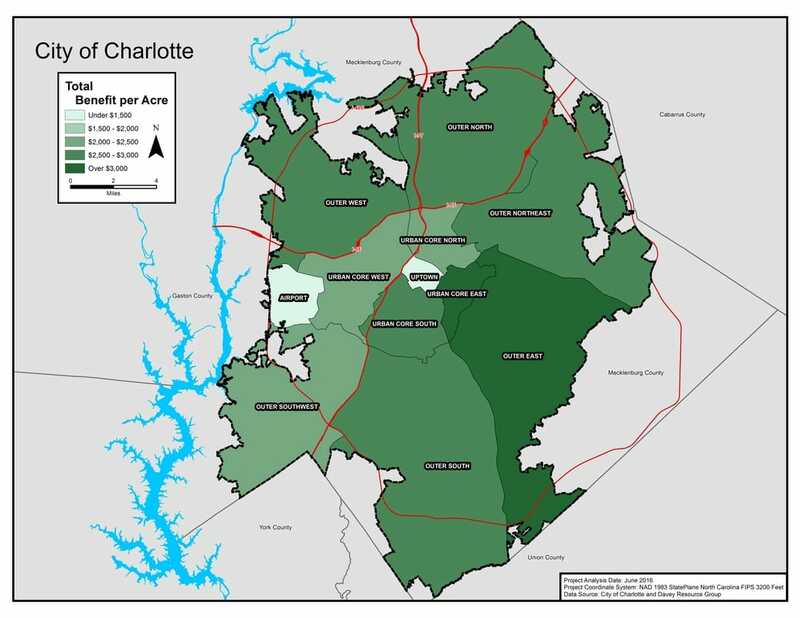 The map below and table to the right show the benefits averaged per acre in the 12 canopy study areas in Charlotte. On the whole, annual tree canopy benefits average $2,721 per acre. But are those benefits spread equally across the city? This can be important, especially when it impacts public health, property value, and community. 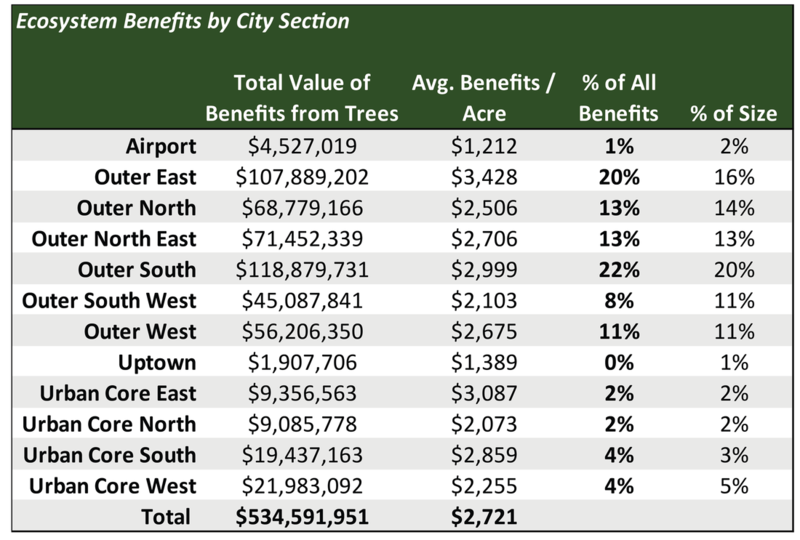 The Urban Core East enjoys $3,428 per acre in annual benefits, while Uptown and Urban Core North are at the bottom of the range at $1,389 and $2,073 per acre, respectively. Beyond equal distribution, an area defined to be "in-need" is determined locally and can be a combination of priorities or focused on one specific priority. Areas of Predicted Future Canopy Loss. Older neighborhoods with a more established tree canopy can anticipate significant losses in future years (see future projections based on the aging canopy issue). One method to planning future planting efforts is to target these replanting areas now to aid in a less drastic succession of trees over time. Benefits-Based Plantings. Areas that have a specific hot button issue like poor air or water quality, or a large percentage of older residents sensitive to heat stress, may work to plant trees based on the anticipated benefits in years to come. 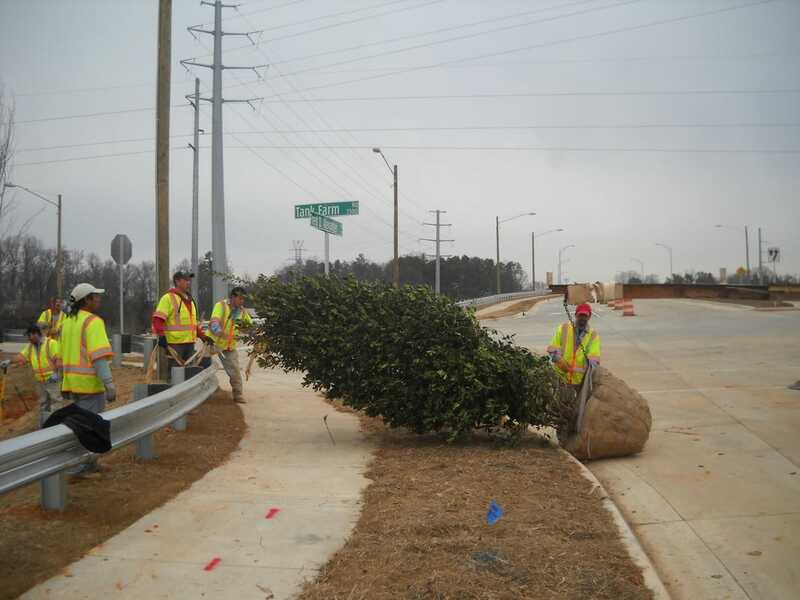 Regular, Methodical Planting in Concert with Cyclical Tree Care Efforts. As shown in the recommended cyclical care system, planting may be most effective if it follows the city's inventory, and pruning and removal cycle of care. Regular methodical planting can also be considered a worthy goal. Species Diversity. Planting strategies should identify not where to plant but what is being planted. Species diversity in Charlotte is currently an issue, with high levels of oak and crape myrtle. A policy on this issue should be included in the strategy. Partners in Planting. As recommended in Action Steps 2: Redefining Roles and Action Step 3: Neighborhood Engagement, Charlotte's planting strategy should also include who is doing the planting. This work can be done by city partners, neighborhood groups, developers, and other interested parties, thus allowing the city to focus on specialized care (pruning, removals, assessments). Take a look at what the annual work of the partners in action might look like. Suggested policies on planting to be included in Charlotte's management plan include referencing aging canopy to emphasize that every tree the city removes must be replaced, and to ensure that annual inventory work includes cataloging future planting sites, and expediting tree planting work as planting funds become available. Further analysis has also been recommended in Action Step 8 to analyze the impact of development (Tree Canopy Protection program, losses, canopy saved, replacement plantings in developments). Results of that analysis will further define an effective planting program. Set planting goals as a Canopy Team. Insert those goals into the city's management plan, but also convey those goals to project partners. For public tree plantings, start inventorying available planting sites in the inventory and agree on which partner will be focused on planting in the coming years, and how that fits into the annual care plan. For private tree plantings, convey the goals and data to large landholders, neighborhood groups, and other players to encourage planting on private lands. It is no surprise that larger trees provide more services to the community. They intercept more stormwater, remove more air pollution, provide more energy savings, and sequester more carbon. However, it is important to understand that this increase in services is exponential. For this reason, preservation of large trees should be a higher priority for communities than planting alone. Consider the air pollution benefits: large healthy trees (greater than 30” DBH) have been shown to remove 70 times more air pollution per year than small healthy trees (less than 8” DBH) (Marritz 2012). 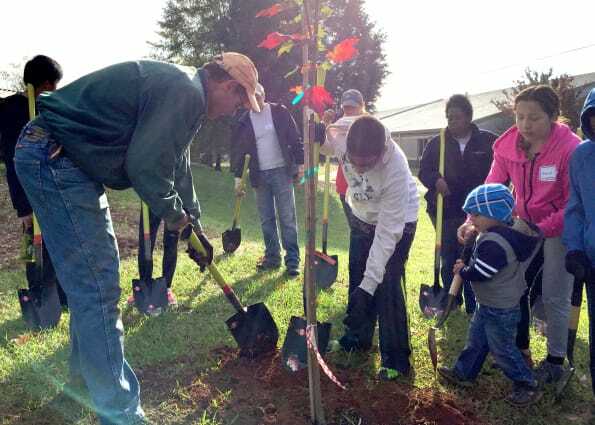 Because part of Charlotte’s vision is to maintain and enhance the services trees provide to residents, prioritizing care for existing trees (over planting new trees) is critical for a healthy community. * Exact replacement equivalent depends on the specific tree benefit to be matched. ​Back to full list of action steps.